Lots of additional feedback incorporated. Give this version a whirl. I also added a link at the bottom of the page so that you can toggle between the old style and the new style to see what you like about each version. Let me know what you think. Many of you have commented that we shouldn’t fix what isn’t broken. Well, there is a significant drawback to the old design. It was optimized for the case when we only had 1 card for sale. This was an excellent assumption for the first few years. Now we average 3 cards for sale per listing. As a result the old style gave a huge advantage to the cheapest card. This caused people to really fight for that cheapest spot. The data that we see that you guys don’t have access to is that sellers are undercutting prices unnecessarily. Buyers are willing to pay more, but sellers are trying to get that top spot. Our solution: More than 1 “top spot”. The new page is designed to feature 3 cards above the fold for about 60-80% of our users. The rest of the users that have smaller monitors will only see 2, but that is still a lot better than the 1. Now our sellers can focus on charging fair prices instead of slashing to get the top spot due to limitations with our old design. I hope that shines some light on these growing pains. A new design isn’t going to stop sellers from slashing prices (which means less fees for COMC of course…). Buyers will still easily be able to see the cheapest priced card and so sellers will still want to be the lowest regardless of the layout. We don’t need sellers to completely eliminate this practice. 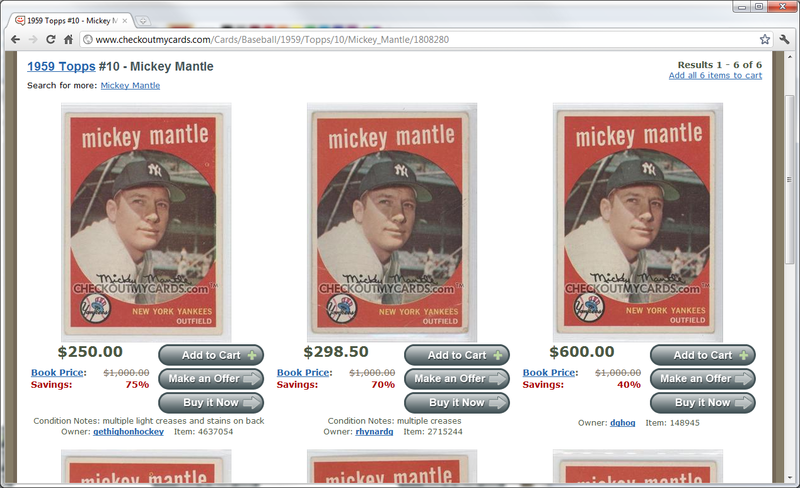 We just need to make sure buyers are less likely to just purchase the cheapest cards with the new design. Once that is the case, sellers as a whole will eventually figure it out. I am going to be setting up some experiments to see if we can get some quantitative data on this. I believe that I like this 4th version the best as it feels similar to the original and also allows side by side comparisons of cards for easier judging of condition, etc. The only thing I did not notice on the new page was the old search feature for “cards from the same set”, I did see “cards of the same player” selection was available. You can search for more cards from the set by clicking the set name hyperlink just above the search for more players. There isn’t a link anywhere to “watch this item”, or the one to see all cards of this particular card from other sellers. I have to say I do like the fact there is a buy it now button accessible right away. Another question though, why is the details page when just simply searching, now changed?? It is very, very tough to see what a price is as there is a big gap now between book price and actual price. Please don’t change this, it is incredibly tough to separate what card is what from card. I see no reason that has to change….looks terribly cluttered. The Watch this Item should appear above the card when you move your mouse over the image. It is not one of the most commonly used features, so I didn’t want it to take up premium real estate. The search page change was a bug. It is fixed. Yeah I finally figured that out about the watch/wrong data etc. Makes sense as far as taking up too much room. Glad to see the search wasnt being changed and was just a bug. This layout is probably the best version of all the new ones. I am starting to like seeing all the cards at once, more than I did. Still prefer the older way, but it is growing on me. I do like the fact you guys are listening to all the feedback from everyone. wow this is hideous! i wish i knew how to screenie my page layouts cause this just ridiculous… i have numbers overlapping pictures, and numbers that are completly covered up by pictures. this is a joke! ill be boycotting the site til things change for the better!! What browser are you using? You shouldn’t see any overlapping pictures or numbers covered by pictures. The site has been tested in Google Chrome, Firefox, Safari, IE 8, and IE 9. Try using Google Chrome for your browser if it looks off. I like the entire new look & showing more cards near the top is good. I like the buttons below the cards. For new users its nice. If buyers are willing to pay more, then why bother to have a Make an Offer button? As a buyer, I’m willing to pay less and unless a card is 25 cents or less, I always make an offer. More than 95% of my offers are accepted because the smart seller knows its all about cash flow & inventory turn around. The only thing that COMC sellers have is the ability to charge what they want or negotiate a price and as a buyer, the only thing that concerns me is price since I don’t have to worry about the individual seller’s feedback ratings. It really doesn’t matter to me who the seller is as long as he/she has the best price. With anything other than vintage, quality is usually not an issue and I don’t collect vintage. Seems to me, the underlying drive is to get the sellers to charge more, which pumps up COMC’s bottom line. You do realize that sellers make at least 4 times more than we do when a card sells. In fact it is closer to 15 times more because of all the recycled store credit. This is not about our bottom line. It is about giving buyers a better experience so that they will gladly give sellers more money, which makes the whole system work better. We are trying to help buyers find the cards that will make them the happiest. Many buyers would be more happy with a better centered card even if it cost a few pennies more. The old design didn’t let buyers easily make this comparison, so they too frequently just went with the cheapest. One thing that is slightly frustrating is that 95% buyers make the minimum allowable offer. Unless a seller has a paid subscription, then they have to deal with all the crappy 50% offers people send (regardless of what the price is). It’s almost a waste of time to even check when an offer comes through because you know it will be low-ball. I like this new one more then the rest. Keep this one and take the rest of the weekend off. I was not in favor of this change at first but I love this newest version. I think you have a winner. I vote for this version. It seems pretty good to me. Like others, I am skeptical that it will increase the value of my sales, but I have nothing to lose. Yes, like this version. And the fact that you can switch to the old view, if you are a fan of the original layout. Great job! Way to go. Nice design and nice rollout. Another line of thinking here is that right now the system showcases the lowest price first. Hence the price slashing to get a higher spot. ( a.k.a. Blow Out My Cards) In most of the cases with the older cards, the lowest card is the most beat up, piece of crap that no shop would ever put in a display case. (a.k.a. Check Out My Crap) Why is That being showcased. I think the nicest card, typically the highest priced, should be the showcase. If the buyers want to “search for a deal/steal” let them. That’s how it works in real life. When we go into a shop, where’s the first place we look. In the glass case. Not through the junk bin. I don’t consider COMC to be somewhere that I send all my crap cards. I put stuff up that I think is desireable. I would love to see some Filtering on a page like this. Sort by Highest Price, Highest % off, etc. Like this where there’s only a handfull of items it’s fine, but there are some cards that have over a hundred items. Also get rid of those gaudy buttons. Plain text links would be better. I think it’s getting better though. My take on this at first glance is the layout of the cards. Old version, scroll top to bottom with single card. Beta 4 version side by side cards up to 4 if you have a 20″+ monitor size. After using it for a week, I like it better simply because of the layout and less time it takes to scroll from page to page if more than 16 of the same cards exist. The “add to cart”, “make an offer”, and “buy it now” buttons are still rather large in comparison to the whole design. If they could be made at 75% of current size, I feel it would look better. The hidden mouse over text above the card for the functions “turn over”, “share”, “wrong?” & “watch this item” are fine and don’t clutter the card details, so good job here. The card detail header and Search for more are easy to read and quick to click through, again enhancing the user experience. Beta 4 appears to be the best choice for me. Thanks for all the continuous efforts. I personally buy 99% of the time and sell 1% of the time. I like the new design. Makes it nice for me to see six or more cards at a time. That has helped me BUY all 6 at a time and quick too!